Neil Harvey was always regarded as the leading batsman for Australia after the retirement of Don Bradman from Test cricket. An aggressive left-handed batsman he played for Victoria and New South Wales in domestic cricket. Read this aricle for more information about Neil Harvey. Neil Harvey is a former Australian cricketer, a left-handed batsman who loves to attack the bowlers. He was one of the most prolific cricketers of Australia during his period. He was also a great fielder. Neil Harvey was born into a family with cricket background. His father Horace Harvey played for Broken Hill and Melbourne Club cricket. His five brothers were also involved with cricket. In 1946 when first class cricket was resumed after Second World War, Neil played his first first-class match against Tasmania. In his second match against Tasmania he scored his maiden first-class century. 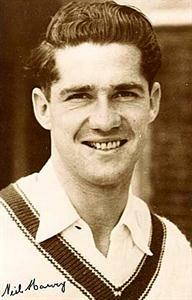 Due to his excellent start in first-class cricket, Neil Harvey played his first Test in the fourth Test against Indian team in 1948. He made only 13 in his only inning of match. In the fifth and last Test played at Melbourne, he scored a brilliant century. He was only 19 years old at that time and becomes the youngest Australian to score a century in Test cricket. In the 1948 Ashes series, he was in the Australian team and played in the fourth test scoring a hundred on his Ashes debut. In the 1949-50 tour of South Africa, Harvey made 178 in the second Test at Cape Town and 151* at Durban in the third Test. His performances consolidate his place in the Australian team. In 1950-51 Ashes series he made 362 runs in five Tests. When West Indies toured Australia in 1951, he was not at his best scoring only 261 runs in five Test match series which Australia won by 4-1. In 1952-53, South Africa toured Australia for a test series. Harvey was in great form during that series. He made 834 runs in five tests including four centuries. In the fifth and final test at Melbourne he made 205 which is also his highest score in Test cricket. He continued his excellent form during the 1954-55 in Ashes and West Indies Tour where he made 650 runs in the Test series with an average more than 100. Neil Harvey lost his form completely during 1956 Ashes series. He scored only 197 runs in five Test series which England won by 2-1. He then scored 253 runs against India in India in three Tests. Against New Zealand he made only 129 runs in three tests at an average of 25.80. In 1957-58 against South Africa, he was not at his best against his favourite opponents. It was also his last series against South Africa. In his 14 Tests against South Africa, he has made 1625 runs with an excellent average of 81.25 including eight centuries and five half-centuries. Neil Harvey was an attacking left-handed batsman. In subcontinent wickets he used to charge against the spinners and was very successful in doing so. His technique was very good. At the start of his career he used to get out by playing in the air due to his aggressive approach. But he has played some great patient full innings also for the team's sake. Apart from his attacking batting Harvey was one of the greatest fielders of his time. His athletic fielding was a great beneficiary to his team.